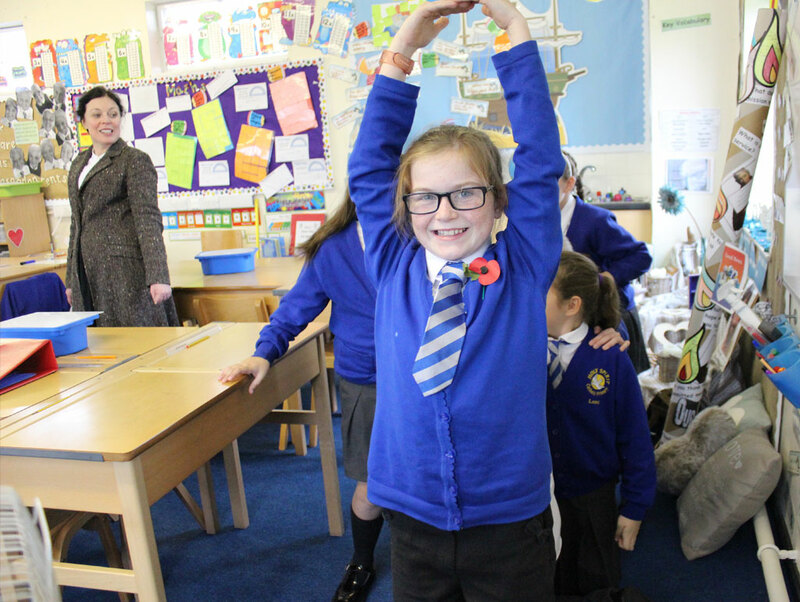 Back in 2014, we commissioned a new play and developed a range of creative workshops for schools, specifically designed to support the exploration of World War One. Since then, and to great acclaim, we’ve taken our immersive and experiential approaches to thousands of children and young people in schools across the country. It’s difficult to comprehend the scale of World War I, with millions of young lives ended by the conflict. So Living with the War explores the events of 1914 – 1918 through the eyes of two families, one wealthy, the other scraping a living, in the fictional English village of Puddington. And this interactive performance shows how, while they may have been hundreds of miles from the battlefields of France and Belgium, they were still caught up in events. With fathers, sons and brothers away fighting, those left at home did their bit by making “comforts” for the soldiers and working in the munitions factories. Commissioned from professional writer and former teacher Paul Burns, Living with the War introduces pupils to the outbreak of World War I – before taking an emotionally sensitive approach to the extents to which its ripples were felt. 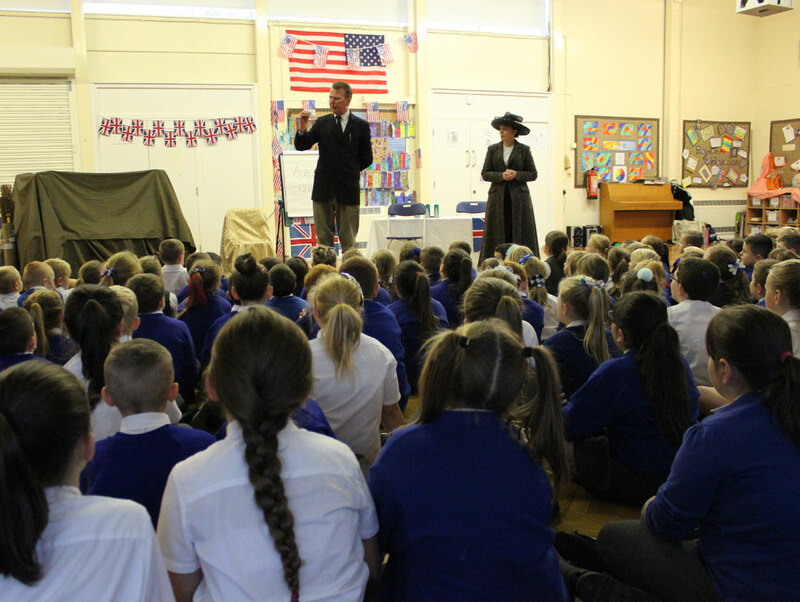 Working with Sir Arthur and Lady Puddington and Lizzie and Tom Mayne, pupils will have opportunities to re-enact a range of aspects of life on the home front (and to learn some topical songs) as they move through the years from 1914 – 18. 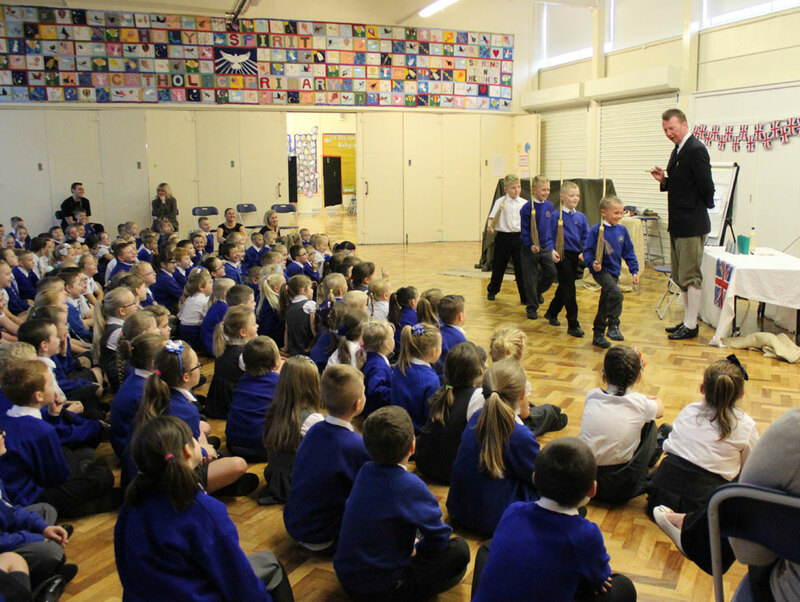 The 75 minute interactive performance (which is suitable for up to 180 pupils at a time) is followed by six, 60 minute, age-differentiated workshops (each suitable for up to 30 pupils) that use drama to explore some of the themes in more detail, (accommodating 120 pupils in total). The performance is particularly suitable for Key Stages 2 - 3 but can be adapted for older age groups – please ask for more details. Outcomes: greater knowledge of the causes and course of the War; heightened awareness of activities on the home front; increased understanding of the roles played by class and gender during the period. 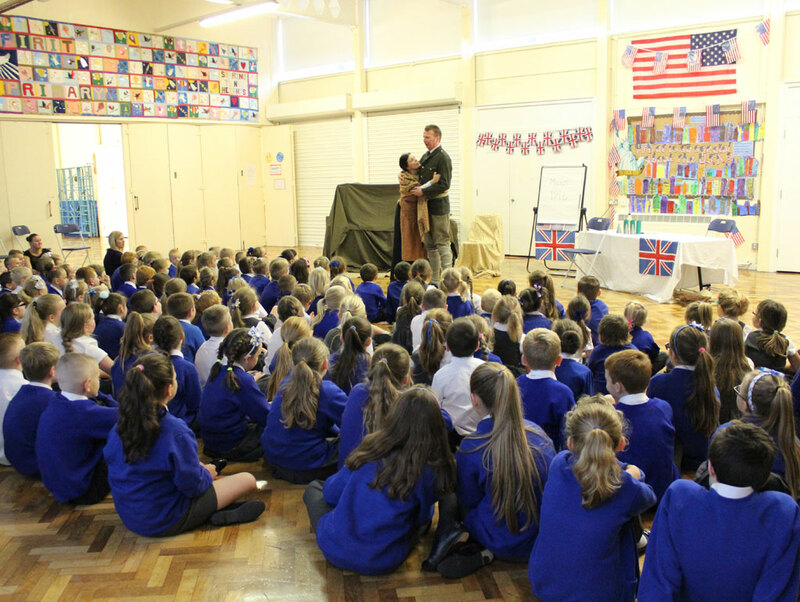 The Reality of War – a drama technique designed to share with pupils’ their visitor’s experience of the war. Mrs Emmeline Pankhurst: a leading figure in the Suffragette movement in the early part of the 20th century, Mrs Pankhurst agreed to support her country during the war. But she wasn’t afraid to speak out when she thought the politicians were wrong! Siegfried Sassoon: Born into a wealthy family, Sassoon became an officer in the British army not long after the war started. After a nervous breakdown caused by shellshock, he used poetry to share with others the horrors of war. Lizzie Mayne: a widow, Lizzie has mixed feelings about the war. On the one hand, it has provided her with a well-paid job in a munitions factory. On the other, though, her son Tom is serving in the trenches – so, like many of her friends and neighbours, she lives in constant fear of “the telegram”. 14-18 NOW, the official cultural programme for the First World War Centenary commemorations, has now been launched. The new 14-18 NOW website is now live, where you can find out more information about the full programme of events. Interested in our History Workshops? Including larger than life, interactive performances, open-ended workshops and more intimate classroom-based sessions, there are four exciting options awaiting you: The Brilliant Britons, Time Travel Theatre, Time Travel Tourists and Historical Maths. Holocaust Memorial Day, marked all over the world, is one of the most important days in the calendar. 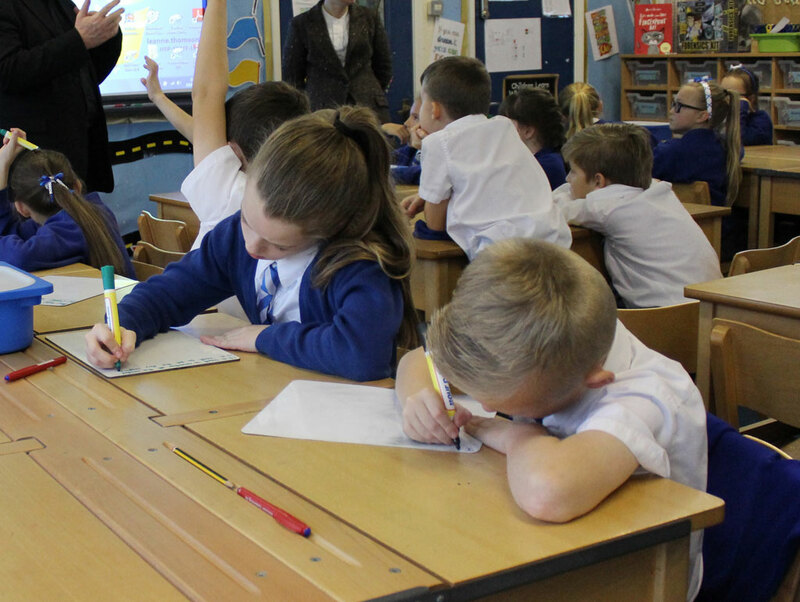 Each year we offer three different multi-arts programmes to primary and secondary schools.